A notorious wildlife criminal has been spotted in Norwegian waters, there to illegally capture a live killer whale for the mega-aquarium industry. Before you can say Ishmael, Special Agent Poppy McVie’s on the case. Armed with attitude, Poppy and her new partner, Special Agent Dalton, set out on the high seas. Trouble is, in the foreign waters of a whaling nation, there’s risk of political entanglements, but Poppy’s got no patience for diplomacy when a killer whale’s being sold into slavery, sentenced to live in a bath tub for the rest of his life. 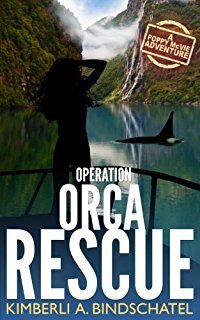 Review: Operation Orca Rescue is the 2nd book in the Poppy McVie series. Although I didn't love the first book, I'm glad I gave this one a try, it was a huge improvement. Poppy and Dalton immediately leave Costa Rica for a new case, involving killer whales. I enjoyed the relationship development between Poppy and Dalton. There is no "insta-love", they are getting to know and respect each other as agents, while learning about each other in process. The case was very interesting and once again, Bindschatel does a great job educating the reader about whaling. Poppy was just as passionate about whaling as she was about the exotic animals in Costa Rica, but she showed some maturity and growth in this installment.